Please note some roads in and around Fayetteville are closed due to damage sustained during Hurricane Matthew. For a list of road closures click here! There is ample parking at Cross Creek Mall. Please DO NOT park in the parking lot directly in front of Office Depot. 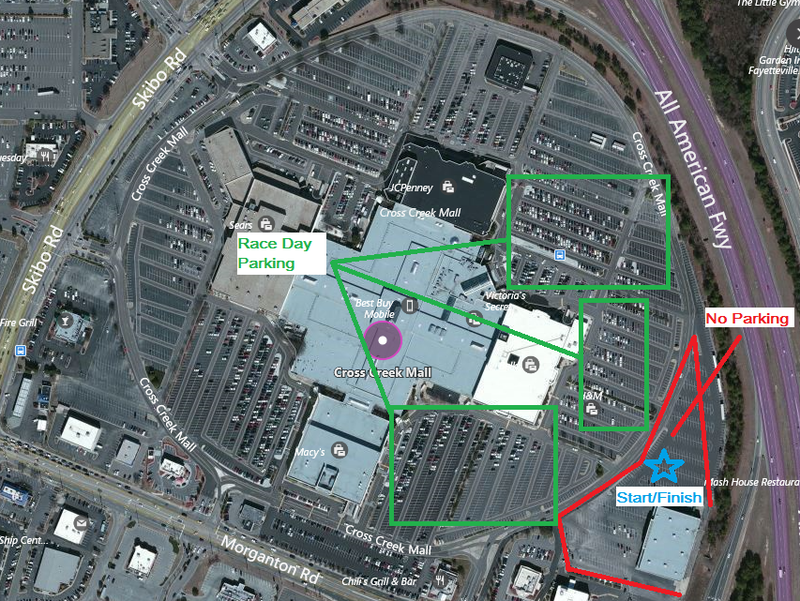 Click here for a map of race day parking! Fairfield Inn at Cross Creek - Located .6 miles from the start/finish area! To book your reservation at the discounted Race 13.1 rate - only $95/night - please call (910) 487-1400 and mention Race 13.1. Rooms will be blocked through October 7 for race weekend: 10 Double rooms and 10 King rooms have been blocked at this discounted rate, so book your reservation soon before all the discounted rooms fill up! Some additional hotels close to the start/finish area at Cross Creek Mall are listed below (click each hotel name to visit the hotel website).